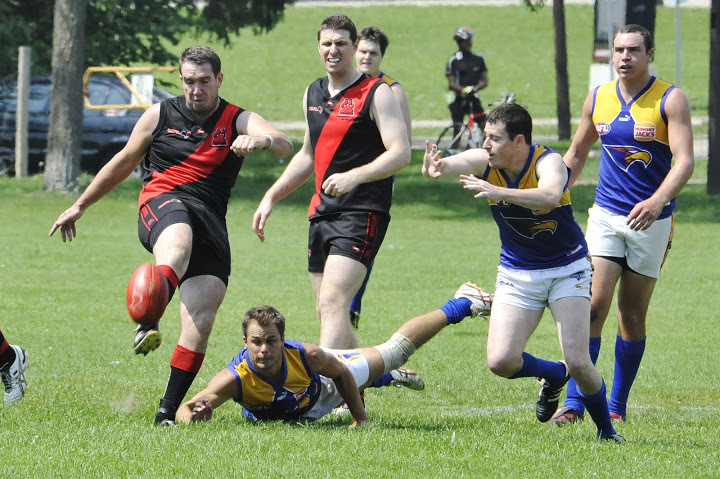 The Dingos will be looking to knock off the only undefeated team in the OAFL this weekend as they take to the field against the Toronto Eagles. The Eagles have drastically improved on their 2012 form, when they managed just one win for the season. The Dingos are rebounding from their first loss of 2013, and will be keen to get back into the winners column. Wade Edwards (Dingos)- Wade was sorely missed in rounds 4 and 5 as the Dingos struggled to impact the scoreboard. A few goals from Wade will go a long way to helping the Dingos get the four points. Camilo Serpa (Dingos)- In his first season of Aussie rules, Camilo has taken to the game very quickly, and has already influenced every match he’s played. Tasos Dimacakos (Eagles)- The Eagles captain always puts in a strong effort in the backline, and his size and skills always make him a difficult matchup for opponents. Clinton Runnalls (Eagles)- Having kicked 19 goals in round 3, he is well ahead in the league goalkicking race. Shutting down Runnalls will be key to the Dingos fortunes. Dave Wells (Dingos)- The 2012 OAFL all-star full back will have a big task this week, shutting down Eagles full forward Aaron Falcioni. As usual, the Dingos will be heading to the Departure Lounge at the Global Village Backpackers after the game for some cheap drinks on a great patio. Drink specials: $12 pitchers of James Ready; $4 basic spirits; $5 Steamwhistle pints and $4 Jager.